Spent 14 days in the wilderness of the High Sierra country–Yosemite to be more specific, the land of John Muir, the Range of Light. Some time back I wrote about a previous experience here, so this will be a revisiting. Yosemite Valley is one of the most spectacular places in the whole world. Its awesome beauty is beyond all description. However….the crowds there are also beyond most anything you will experience unless you make it a habit of large urban rush hour congestion. Best to go there in the winter when the crowds have radically diminished. All you need is camping gear that can handle the cold weather. Like in all human activity, there are quite a lot of different kinds of people in the High Country with very different reasons for being there. For example, one early morning I was sitting at Tenaya Lake, this pristine High Sierra lake that is easy to reach because of Tioga Road. This was one of John Muir’s favorite lakes, and it is stunning in its beauty, its clarity, its surrounding cliffs. After a few hours there, a bus load of German tourists appeared. They got off the bus all with cameras, took their pictures, and off they went back on the bus and onto the next stop. This is a common occurrence–more often it is just a small group in a car. Even so….I am sure that somehow someone’s heart is touched by the reality he/she witnesses and it is not just a moment of “capturing” an image for a collection of experiences. Needless to say the campers also come in all “shades and flavors”–all kinds of reasons for being there. Most stay 3 or 4 nights and take in the beauty of the place by hiking the innumerable trails. But regardless who they are and what reason brought them here, the wilderness speaks to them. She speaks in a language that to most is incomprehensible yet very soothing, inviting, peaceful, calling them home to their own heart. I think many intuit this but are unable to put it in words what it is they experience. They feel this inarticulate peace upon which they perhaps do not even stop to reflect. Trails there are here!! So many and such variety that whatever be one’s inclinations or capability, there will be a trail for you. There are the modest day-hike trails of 2 to 6 miles in length. Then there are the more challenging overnight hikes of 10 to 40 miles where you sleep in the wilds. These take you into the remote backcountry of the High Sierra where you might not see anyone for several days. These require some backpacking skills and gear, but the rewards are enormous. Then, of course, there are the Great Trails–I mean the John Muir Trail (the JMT) and the Pacific Crest Trail (the PCT). The latter runs from the border of Mexico to the border of Canada. What a journey!! 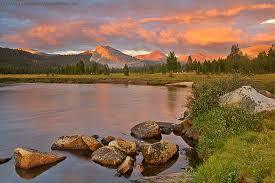 The JMT may be one of the top most beautiful trails in the whole world. Tuolumne Meadows is a starting point for the JMT (and it terminates at Mt Whitney in the Southern Sierra), and it is a rest and resupply point for the PCT. There’s a store here and a post office where many long distance hikers send packages to themselves to pick up when they finally reach this point. I talked to a young couple who were starting off again after 2 days rest. They had started at the beginning of April at the Mexican Border. They were not even half way done! Now just as with campers and people in general who come to Yosemite, the hikers also do their hiking for a myriad of reasons and motivations. (Indeed people come to monastic life for such a variety of reasons, and the whole point of growth in monastic life is to shed all the false reasons and find that one true quest buried in the heart.) There are those who take up these trails–especially the JMT and the PCT–as a kind of challenge, something to prove to themselves or to others, another “conquest” to add to their list (or resume), another credential to show “who they are,” etc. As a matter of fact, I read a mountaineer lament that Everest has been beset with these kind of people also–usually well-off who can pay $50 to $60 thousand dollars to get a guide to take them to the top to satisfy their ego. But many, many hikers hit these trails, the short and the long, because they are drawn by the beauty of the wilderness, by what She speaks to their hearts. Some of those on the long trails speak of a transformative experience. Their sense of self and who they are and their vision of the world changes by the time they finish the long journey. Then there are the few “Traildogs,” people–both men and women–who seem to live on the trail. They have in a sense become one with the trail. They leave the trail only to resupply and then off they go. The trail is not a means to an end, an instrument for some goal; another experience alongside a collection of some such “adventures.” They somehow get around the “permit limitations” that the National Park Service and the Forest Service puts on them for they seldom seem to leave these trails. I met one remarkable such Traildog, a woman of about 70, who stays in Fresno during the winter months and then during the Spring to Fall she is in the mountains with only a backpack. I think she buys food with her social security check. She had the face of an ancient Chinese sage or one of those Native Americans so eloquently photographed by Edward Curtis. I brought a number of things to read when I went camping in the High Country. I had Shankara, the Upanishads, the New Testament, and Abhishiktananda’s “The Further Shore.” I also had the complete poems of Han-shan, Cold Mountain, translated by Red Pine (Bill Porter). But interestingly enough I couldn’t get into anything else except Han-shan. All else seemed too wordy, and somehow nothing seemed to resonate with the wilderness more than Han-shan. So I kept company with him during my whole stay. Just went “with the Flow” as a good Taoist!! For those who don’t him, Han-shan is a most remarkable fellow who seems to have lived in China in the late Tang Period, around the 8th Century. We don’t know too much about him because he hid his identity very well. He seems to have been a “somebody” in upper Chinese society, a learned man and a scholar, a government official early in life. But at a certain point he “flees” all this–either out of necessity (some scholars believe he had to flee for his life) or out of utter disillusionment. In any case he ends up in one of the remote areas of ancient China, living in a cave as a hermit. In this regard he reminds one of the Christian Desert Father Arsenius who had been a “somebody” in ancient Rome and fled all that. What is striking is that Han-shan never became an official monk, never entered a monastery, never had a spiritual teacher as such(in that regard he is even more “stark” than Milarepa who did have a spiritual teacher at least). He shows a great awareness of the Buddhist and Taoist Classics, and his spiritual path is a typically Chinese amalgam of the two paths. He wrote over 300 poems/songs, short pithy things showing great poetic skill that of course cannot be captured in translation. What is amazing is that this obscure, lonely figure is one of China’s most popular figures(he is also revered in Korea and Japan). As I said, Han-shan was never officially a monk, but he often visited a monastery that was about a 2-day hike from his cave. There he had a very good friend, Shih-te who was his equal in spiritual maturity but not quite the poet that Han-shan was. Shih-te was also not a monk but a layworker in the monastery kitchen. Amazing how often that happens and where you will find the deepest people….!! In any case, Shih-te would give Han-shan some food and supplies to take back to his cave, and the two would have these great poetic conversations and constantly laughing and having a good time together. 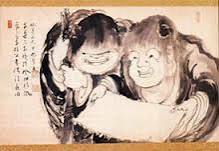 In later Chinese art they are often depicted together. Han-shan’s name can be translated into English as “Cold Mountain.” Whenever you see that reference in his poem, it actually has three meanings. First of all, of course, it refers to that geographic location of the cave–its name was and still is today: Cold Mountain. Then that term refers to his hermit identity. We don’t know what his name was in Chinese society, but now his new identity is indicated by that term: Cold Mountain. Finally, and more subtly, “Cold Mountain” refers to Han-shan’s state of mind, his awareness, his heart. Comment: Of course the “tripods and bells” refers to both ritual religion and economic well-being. Comment: Remember that every reference to “Cold Mountain” has three referents. Comment: Very similar sentiments in a very different cultural and geographic setting by the Desert Fathers of Scetis. Comment: Both of the above poems illustrate Han-shan’s sensitivity toward the wilderness and his kinship with John Muir. Indeed, Muir himself could have written these words as he was living in Yosemite. Comment: Interesting image of the “pearl”—it appears several times in his poems and of course it refers to his realization of his “Original Mind,” his Buddhahood, his enlightenment. The Gospel also uses this image of the pearl: recall the Pearl of Great Price which someone who wants it needs to give everything he has and is to obtain it. Comment: Han-shan was critical of the established religion in China which was mainly Taoism but also the complacent Buddhist monasticism of his time. Already the Taoism of the Tang Period was slipping into decadence and corruption, into a kind of magical superstition and a search for personal immortality that was no more than a perpetuation of the ego-self through some kind of “deus ex machina” process. Instead, Han-shan is always pointing at the luminous Self that you already are—that’s all that matters. Comment: According to Red Pine, the “ten names” refers to the ten titles that each Buddha has. “Cicadas” are hermits; “crows” are the regular monks. According to the Buddha, the whole earth preaches the Dharma. Comment: One of the very attractive features of Han-shan is that he never presents himself as a Teacher or Guru or Wise Man. He is always “with you,” a fellow seeker and searcher. This entry was posted in Monk's Way and tagged Cold Mountain, John Muir, John Muir Trail, wilderness, Yosemite on July 3, 2014 by Monksway.